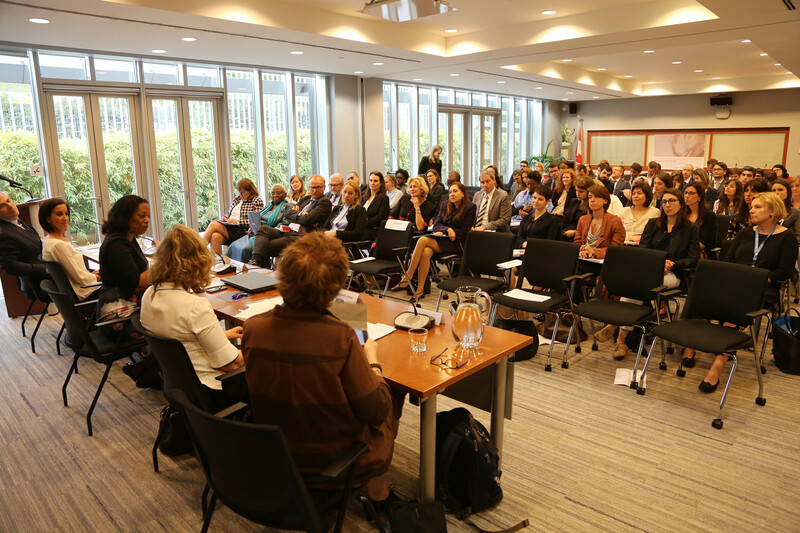 On 23 April, 2018, JRR and UN Women held an expert discussion and film screening on the topic of “Investigating Conflict-Related Sexual and Gender-based Violence: The Case of Syria and Iraq.” The event, hosted by the Permanent Missions of Canada, Sierra Leone and Switzerland to the UN in Geneva, brought together high-level representatives of States, bodies of the United Nations, international organizations and civil society. The discussion was an opportunity to examine the importance of specialized expertise in the investigation and documentation of sexual and gender-based violence (SGBV), and in particular to learn about the work of experts deployed from the JRR-UN Women SGBV Justice Experts Roster. 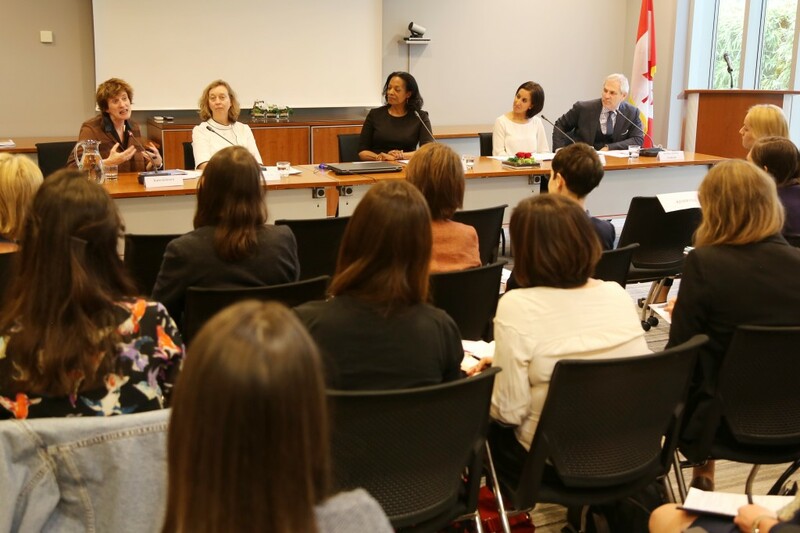 The event was opened by Ambassador Rosemary McCarney, Permanent Representative of Canada, and Christine Löw, Director, Geneva Liaison Office, UN Women. This was followed by the JRR-UN Women documentary film “Evidence of Hope”, which presents the work of two SGBV investigators and four young survivors of SGBV they met during their time documenting gender-based violence in Syria and Iraq. Following the film, co-Host Ambassador Yvette Stevens, Permanent Representative of Sierra Leone made short remarks and introduced the expert panel, composed of: Kate Gilmore, UN Deputy High Commissioner for Human Rights; Michelle Jarvis, Deputy Head of the Syria Independent, Impartial International, Impartial and Independent Mechanism for Syria (IIIM); Rabiaa El Garani, a SGBV investigator on the JRR-UN Women Justice Experts Roster; and Andras Vamos-Goldman, then-Executive Director of JRR. 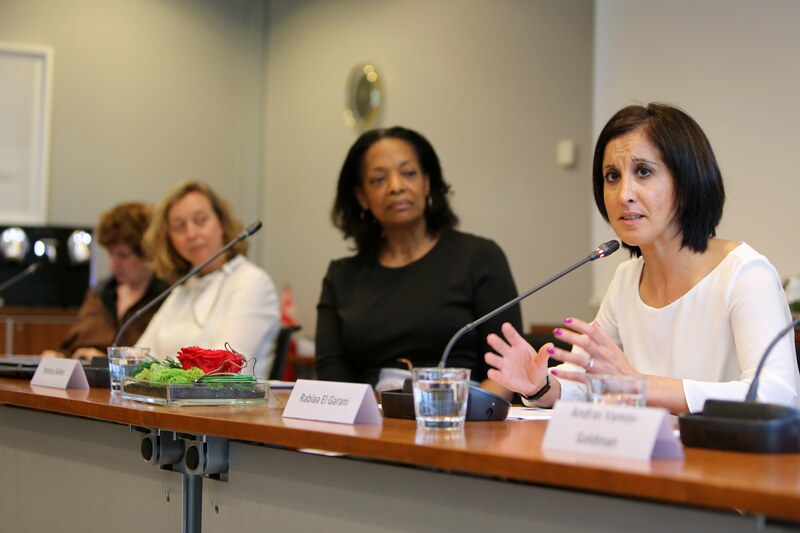 The panel was moderated by Ms. Patricia Sellers, Gender Advisor to the Office of the Prosecutor of the International Criminal Court (ICC) and expert on the JRR-UN Women Justice Experts Roster. Ms. Kate Gilmore, UN Deputy High Commissioner for Human Rights and first panelist to take the floor, began by thanking JRR and UN Women for showing the audience the courageous work of their experts. Sharing her experiences as an investigator, SGBV expert Rabiaa El Garani reminded the audience to take the survivors’ perspective into consideration. She pointed to specific cultural sensitivities that must be taken into account, explaining why attention to gender must be paramount, and even when considering the composition of an investigative team itself. “In most places in the Middle East, a female survivor will never tell a man she has survived SGBV, because in that culture, female virginity is a matter of great concern,” explained Ms. El Garani. Ms. Michelle Jarvis, Deputy Head of IIIM Syria highlighted the many challenges but also the significant opportunities that the international community is facing with regard to the investigation of SGBV. 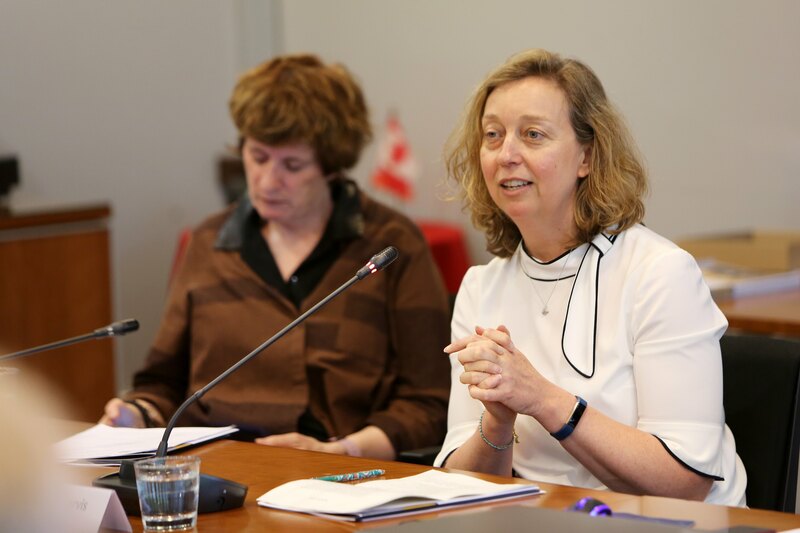 She underlined that the international community now has a professional category to refer to for the investigation of SGBV crimes, and has accumulated real experience within the architecture of international criminal law. Andras Vamos-Goldman, then-Executive Director of JRR, spoke to the great benefit of having rapidly-available experts in sexual and gender-based crimes, encouraging States to support the joint JRR-UN Women SGBV Justice Experts Roster. 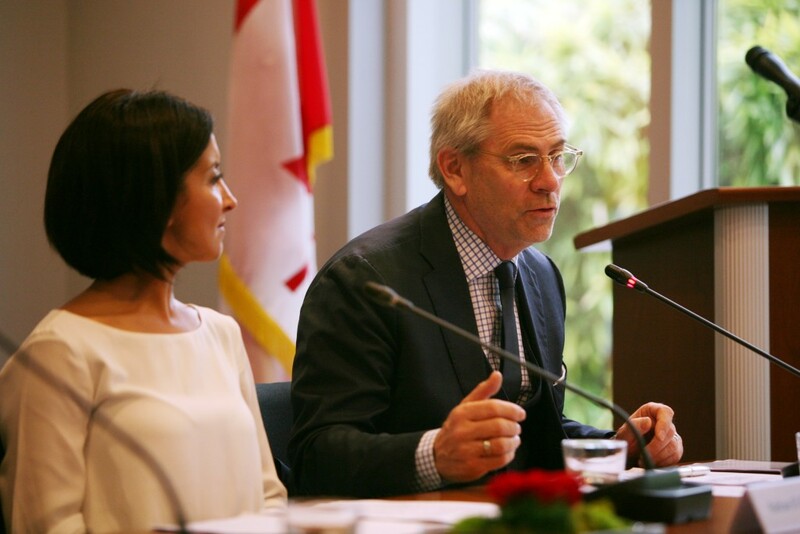 Closing remarks were given by Co-Host Ambassador Valentin Zellweger, Permanent Representative of Switzerland, who thanked all the participants for the expert discussion, and who noted the significant progress made for accountability for SGBV crimes in such a short time. The Ambassador also took the opportunity to thank outgoing JRR Executive Director Mr. Vamos-Goldman for his leadership of JRR and his contributions to advancing the field of international justice. The expert panel was followed by a session of questions and answers with the audience. Learn more about the JRR-UN Women SGBV Justice Experts Roster in our factsheet or explore our work in the Webby Award-winning interactive website Justice Now.